The IBI Biochar Certification Program is a voluntary scheme administered by the International Biochar Initiative (IBI) to provide certification of biochar products. The purpose of the program is to provide to biochar manufacturers the opportunity to demonstrate that their biochar(s) meet the minimum criteria established in the most recent version of the IBI Standardized Product Definition and Product Testing Guidelines for Biochar That Is Used in Soil (also referred to as the IBI Biochar Standards). These Standards, which include stipulations of maximum concentrations for potentially toxic elements and compounds, serve as the foundation of the IBI Biochar Certification Program. IBI will allow biochar that successfully passes the testing and other criteria in the IBI Biochar Standards and meets all other certification program requirements, to carry the IBI CertifiedTM biochar seal. Note that the IBI Biochar Certification Program does not certify any other product, including a product mixed with biochar, nor does the IBI Biochar Certification Program certify biochar systems, processes, technologies, or equipment related to the production of biochar, whether proprietary or otherwise. The IBI Biochar Certification Program also does not address issues of sustainability, energy or greenhouse gas balance, or life cycle analysis. A primary goal of the IBI Biochar Certification Program is to create consumer and marketplace certainty around biochar by creating a standardized, recognized system to certify biochar that meets the IBI Biochar Standards. The IBI Biochar Standards ensure that biochar materials intended for application to soils meet minimal physicochemical properties and safety tests designed to identify the presence of certain potential toxicants. IBI believes that globally-developed, science-based, transparent standards and certification opportunities for biochar materials will provide market and investor assurances that are necessary to drive commercialization of this important industry. 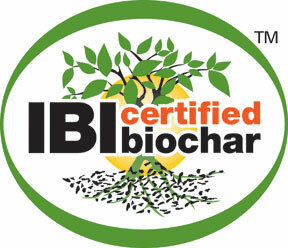 The biochar community recognizes IBI as a credible brand. Buyers are assured that biochar with the IBI CertifiedTM biochar seal meets the IBI Biochar Standards for material characteristics and passes screening tests for certain potential toxicants. Through this program, IBI offers biochar manufacturers and consumers product differentiation and quality assurances in a rapidly-growing marketplace. Biochar manufacturers are required to label their certified biochar in a specific way that informs buyers of the properties of the biochar they are buying. Click here to find out more about labeling requirements under the IBI Biochar Certification Program. If you have questions about the IBI Biochar Certification Program please email us at certification@biochar-international.org. Phase 1 of the IBI Biochar Certification Program is focused only on implementation in the United States and Canada. Until further notice, IBI will only accept applications from biochar manufacturers in the United States and Canada. This restriction is necessary because the IBI must be able to protect the trademark against unauthorised use in any territory in which it is issued, to preserve its value. IBI intends to expand the IBI Biochar Certification Program scope internationally in the future as resources (to obtain the necessary legal advice and mechanisms) permit.